Even though QuickBooks is developed for the layman to navigate, the initial installation and setup procedures must be followed correctly so that all forthcoming information is correct. All required setup data for manual accounting reports is also needed to install and organize QuickBooks on your operating system. The job is more complex if you are transferring your accounting system into QuickBooks mid-year. Your department will need to decide on which accounting technique will choose and specify a chart of accounts that will work for your company. You’ll also need to address how beginning balances will be entered. A QuickBooks specialist can clearly address all of these start up concerns and perform the Initial Setup and Installation process timely and efficiently. Also, your accounting department members will get adequate and customized training on the software package to improve their performance. What does it cost? First, we would like to learn a little more about your company and your accounting documents before we proved you an accurate quote. You can be certain that we assist many small business owners and our rates are established to stay within our clients’ budgets. Review and access your accounting and software needs. Offer hardware and software requirement advice. Install software, create and set up chart of accounts and entire accounting package including inventory, accounts receivable, accounts payable, payroll, etc. Determine of your QuickBooks date of start. Install your chart of account and balances as of that starting date. Prepare of a list of products you sell to your customers. This list includes services, inventory parts, non-inventory parts, other charges and sales taxes. Enter your ending statement bank balances and outstanding checks & deposits in transit from the starting date. Print a trial balance as of starting date. Match it to your trial balance from your old system. Enter your transactions as of your starting dates into QuickBooks. Train owner and team how to use software to fulfill their accounting, management and tax needs. Follow up training to ensure the client is using software appropriately. 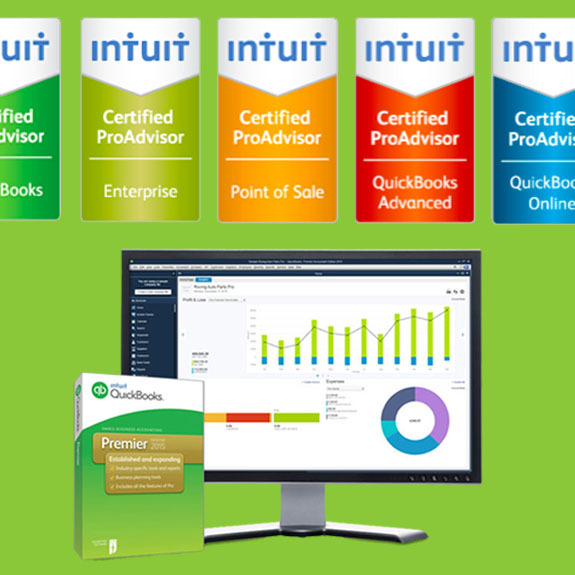 Review Monthly, quarterly or annual client QuickBooks data to help with tax preparation and management documents.